A living room looks at its gorgeous best when it is anchored with an elegant white sofa. A white sofa has the most capability to bring life to other accessories and features of a living room. If you have a wish to transform your living rooms into bright, cozy and stylish hubs, then you must look for these elegant white sofa living room decor ideas showcased below. Here, you will get ample information about how to combine various elements together with white sofas and couches. 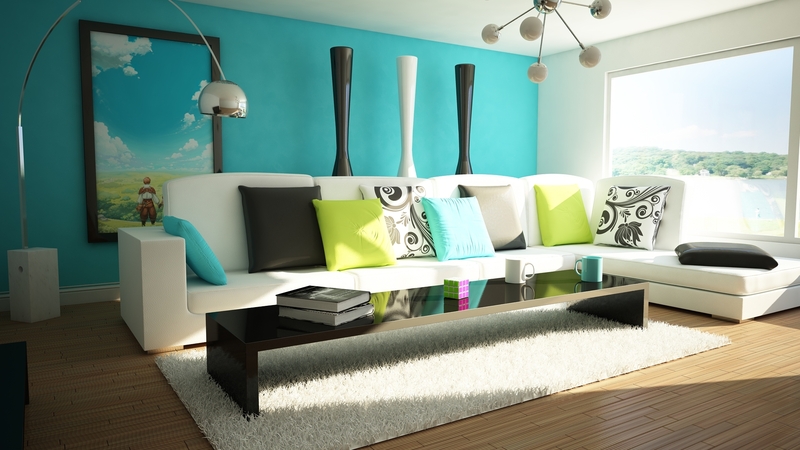 All these living rooms have white sofas in common with different color palettes, accessories and styles. Enjoy! White matches well with any color palette, be it neutral or dark. The picture above shows a modern styled living room that has been decorated with two main color schemes; black and white. 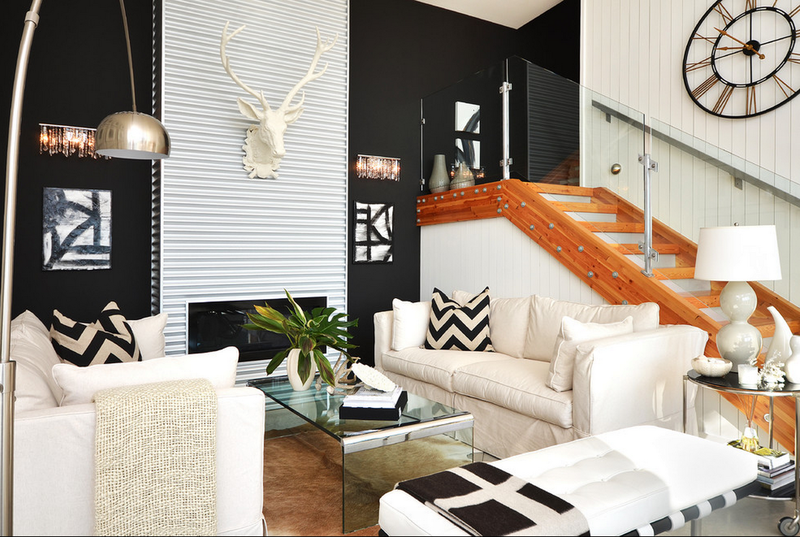 While, the chunky sofas placed are pure white, the cushions thrown over them have black and white chevron patterns. These patterns mix and match with the black and white wall. The chevron design stands in stark contrast with the whiteness of the sofas that makes the whole decor gorgeous. Vibrant shades like red match well with white and lend a cozy feel to the whole decor of a room. Seen above is an image of a Mid Century living room where the decorator has installed a white sofa and two white comfy chairs. The whiteness of these three furniture pieces seems to get a good boost from the red accents present in the pillow, flowers and the paintings. The reds get a good boost from the neutral tans present inside the room. Here, the decorator has styled the room on Palm Beach lines and has placed a gorgeous white sofa that has blue lining on its borders. 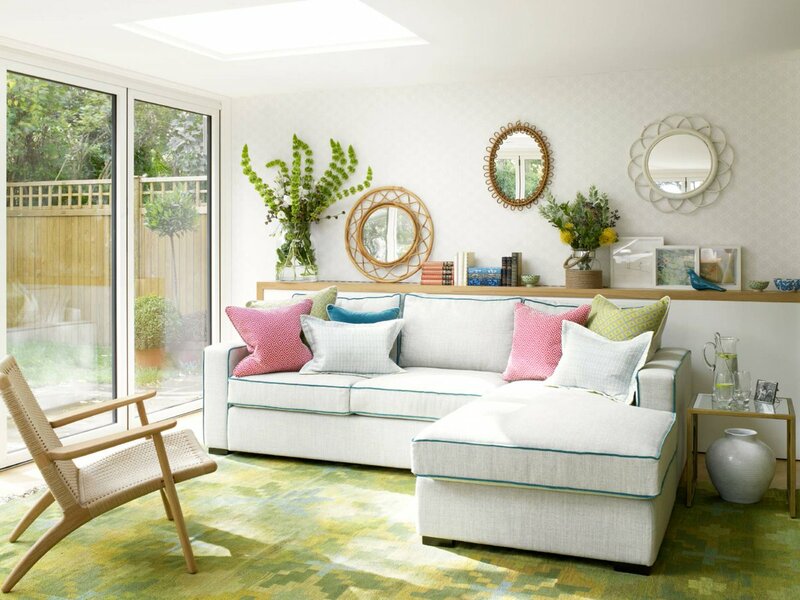 The white sofa looks stunning against a patterned green rug, and the white walls. On the walls, you can hang mirrors in various forms, as shown above. Keeping greens and flowers too can help enhance the vibrancy of a room. A white living room, in order to look contemporary and chic, must feature modern accented accessories that mix well with neutrals as well as metallics. Above, we have presented a chic living area that has been dressed up very elegantly. 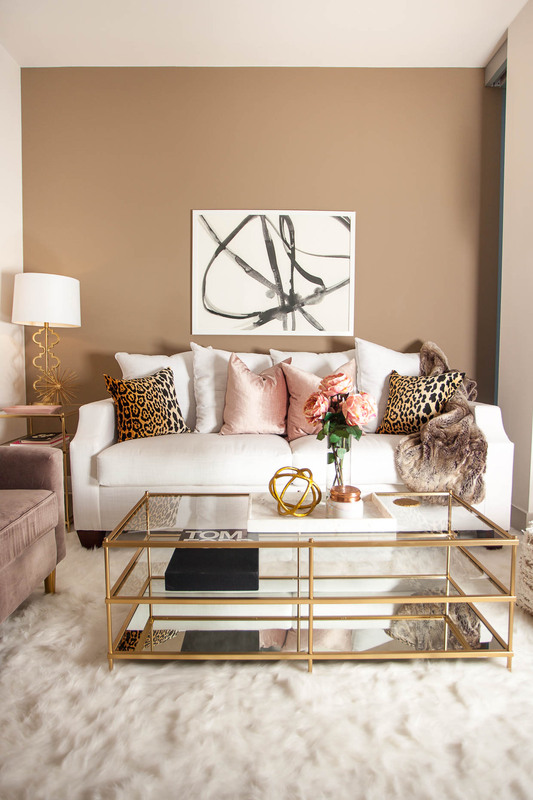 It has a white sofa flanked by a console table at one corner and a golden toned metallic coffee table at the center. The white sofa is layered with cushions having animal prints. Along with these, there are other cushions in pastels. The wall behind the white sofa looks chic with a modern artwork. The room above bears the feel of a beachfront house and is simple, yet classy. 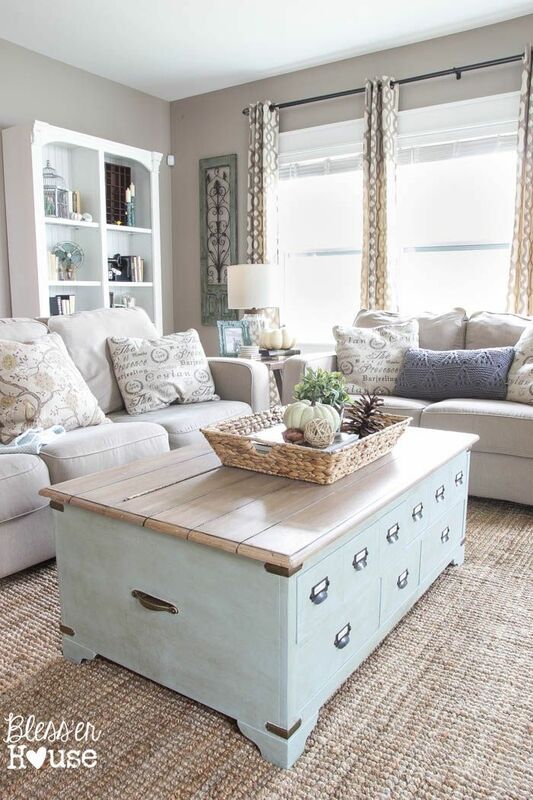 Hogging the limelight in this room is the re-purposed wooden filing cabinet chest that has been transformed into a coffee table. The fabric color palette seen on the pillows, rug and curtains borders is neutral and looks very chic. Another feature that adds to the simplistic style of this room, and that is the organic centerpiece on the coffee table. This New York house features a gorgeous living room that is dressed with a stylish white couch, plush rug, a rustic coffee table and a fluffy chandelier. The decor looks feminine with the subtle white color scheme present in the room. Also, the faux fur seen laying on the couch adds to the comfy look. Other highlights that match beautifully with this white living area are the pocket watch clock and the greens. The modular white sofa set surely looks eye grabbing along with the black shimmering chandelier with candlestick lights. The chandelier lights up the colors present in the decor. It also matches nicely with other black accessories like the tripod floor lamps flanking the white sofas. The nautical color palette here seems to blend in seamlessly with the white colored sofas. Looking at the room above, it seems that its styled on modern lines with ample contemporary accessories used here and there. For example, there is a metal chandelier with crystals, books, pots and wooden television wall. The living room looks bright and refined with antique decorations that gel well with candles and vase decor. The living room of West 18th Avenue stands out in this list with its eclectic choice of furniture and cool color schemes. The decor comprises of a long white couch flanked with throw pillows where one of them has blue and white designs. The couch stands in stark contrast with the wooden Ikea chair that has an upholstery in blue and white floral patterns. The white walls match well with the wooden fireplace and the mirror. The living room above is quite colorful and infused with a comfortable feel. Here, the decorator has placed two white sectional sofas and throw pillows of various colors. The whiteness of this room is balanced by wooden paneled roofing as well as the black ottoman coffee table placed in the center. The above showcased white sofa living room is decked up in various shades that work seamlessly with one another. You can see colors like orange, red, and black working in sharp contrast with the dominant white color scheme. The focal point in this room of course is the white sofa. In the middle, lies a rustic wooden coffee table dressed up with many contemporary decorations. 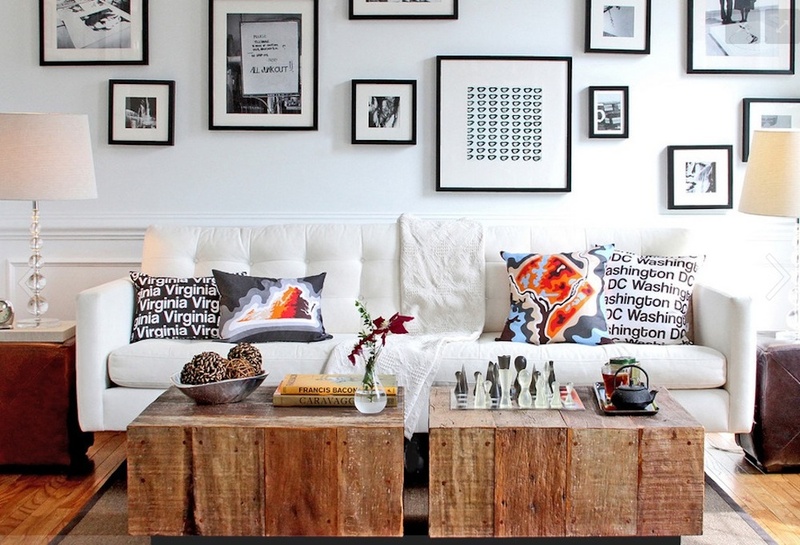 The look of the white couch and the throw pillows layering it gets a boost by the framed wall. If you want your white living room to start looking bright and alive, then you must choose to paint your wall with an accent color. In this picture above, the living room’s dominant color scheme is white. And, to most, it would have looked cold if the blue painted wall was absent. With the blue painted wall behind the white sectional sofas, the white’s coldness seems to vanish, and instead, you get to see a bright and airy looking decor. Matching well with the blue wall and white sofas are the throw pillows. A very colorful living room, it definitely rates high on our list of elegant white couches living room ideas. The white couch looks stylish with pillows in various pops of colors. The color of the pillows matches well with the DIY painting that is hanging right over the fireplace mantel. The three layered chandelier in metallic tones looks unique and fits the decor completely. Then beautiful blue vase with flowers sits stylishly on the round coffee table. One of the most eye grabbing features of this white living room, apart from the Custom club white sofas, is the over sized coffee table. It is a large coffee table and is Mid Century in style. Its wooden accent helps it to enhance the white scheme of the whole room. The yellow flowers that are arranged in a white vase add pizzazz to the decor. It suddenly breaks away the monotony set in by white which makes the room look bright and cheerful. In the picture above, we have a stylish antique themed white living room where the decorator has placed slip-covered white sofas along with other white elements. Rustic tones are set in with the help of two wooden cabinets with pots and lamp. The stairwell seen above looks antique with mirrors that are hung on the walls. The light color scheme seems to work like magic with all these antique accents. The picture above is that of a loft living room in Georgia. Its themed on industrial lines and has been dressed with a white couch, wing-back chairs by Aidan Gray and a farmhouse coffee table. 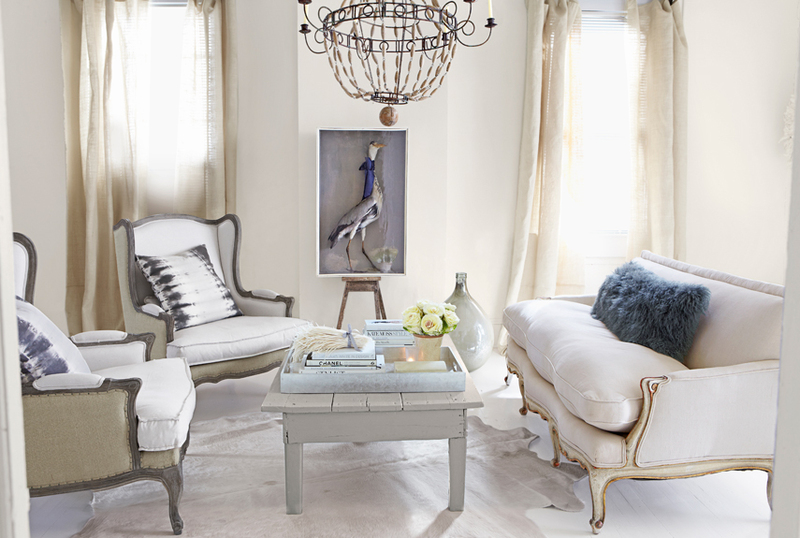 The coffee table is gray in tone and lends a romantic touch to the whole decor of the room. The whiteness of this room seems to do away with dullness as the decorator has placed a wooden stool with a heron figurine inside it. It definitely brings in a sudden and a welcome change to the ambiance of this room. Apart from this feature, the other two harbingers of romance in this room are the tie and dye cushions and the ruffled Mongolian pillow. White dominates the color palette of this living room of a Californian home where the walls, the roof, and the furniture are all white, except for the rustic coffee table and the sleek cupboard. These two pieces definitely break the monotonous look of the white with the centerpiece that brings in pops of color to the decor. Can you imagine a more vibrant looking room than the one shown above? No, we guess! The living room here is longish in design and has white accents splashed on the walls, the sofas and the roof. There are two long white couches placed on either side of the room. These are flanked by colorful pillows placed casually. The carpet spread on the floor helps in breaking away the whiteness as its full of bright colors and looks spectacular against the white coffee table and the sofas. The fifties were a period when people played with bright pops of colors and quirky decorations in their homes. Seen above is a ranch themed living area that is inspired by the fifties fashionable decor. It looks colorful with floral curtains and pillows. These colors match pleasantly with the white sofa. It is a traditional living room that is designed for entertaining loads of guests. The room has two seating areas whereby the decorator has placed white sofa sets and pastel themed curtains. The decor looks classy with a floral centerpiece with hints of greens. The dark console table and the abstract painting on the wall break away the iciness of this white room. The ambiance of this living room is calm and composed. It has flooring made of dark hardwood that works in contrast with the white linen couches and white walls. The wooden paneling gels perfectly with the brown leather naval captain’s chair in antique finish. The white color scheme mixes nicely with this brown tone present in the room. 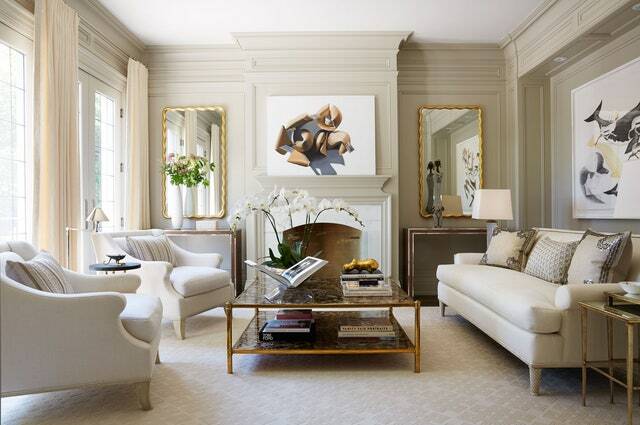 There are neutral tones present inside this luxurious looking living room. The moment you come inside, the green planter greets you with an open arm. It acts as a breaker of the monotonous scheme created by white seen on the couch, the curtains and the wall. And, it also gets integrated seamlessly. The wooden flooring too adds to the casual flair of this 250 square foot room. The white sectional sofa in the picture looks elegant against a backdrop of stunning cream and beige painted walls and dark toned floors. The window by the room lets ample sunlight to come and freshen up the interior. On looking at the decor closely, you will see how wonderfully the dark accents get integrated with the neutral tones. Does wood integrate perfectly with neutral tones like cream, beige, black and white? Yes, it does, and how so beautifully as in this picture above! 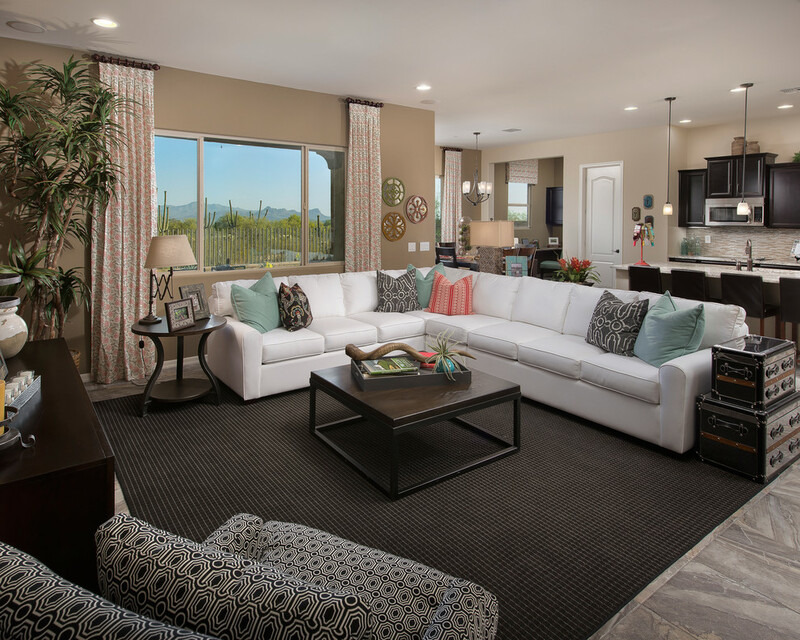 The living room is a homeowner’s paradise which is infused with warm accents and plush furniture. The white sofas look adorable, specially when they are complemented well by the blue and white floral pillows thrown on them. The wooden coffee table and the antique cabinet with myriad stylish accessories help in creating a warm ambiance. The white scheme used in the living room above seems to work easily with the wooden tones present. This is a Californian living room which has been installed with white sofas that are slip-covered. The curtains are neutral toned and offer a great backdrop for the wooden coffee table and the brown flooring. A white color scheme in any room tends to create a cold space, most people say. But, there is one easy way to break the iciness and bring in warmth and cosyness. You can use fluffy and layered cushions and throws on the white sofas in bright shades, and also use rustic elements in the form of wooden coffee tables and flooring. In the picture above, the room looks breezy with a white color palette, but, at the same time, it does manage to usher in a feeling of warmth. The flower and the sailboat model in blue and brown lends quite a bit of punch to this moderately spacious living area. An easy breezy living room is showcased above where the walls, the ceiling and the furniture are dipped in pure whitish color. But, the iciness of the room is broken by the green and wooden elements used throughout the room that integrate perfectly to create a warm and cozy place. 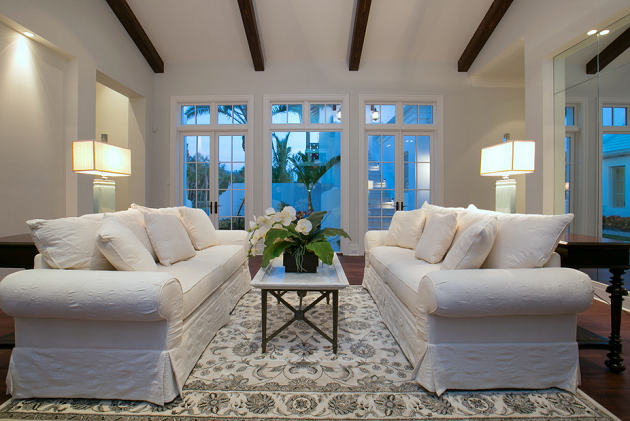 The couches above are white and are complemented well by the printed rug spread across the floor. It merges nicely with the floral arrangement placed on the coffee table. The wooden paneling done on the roof too helps bring in warmness to the decor. There are umpteen white sofa living room decorating ideas on display today. 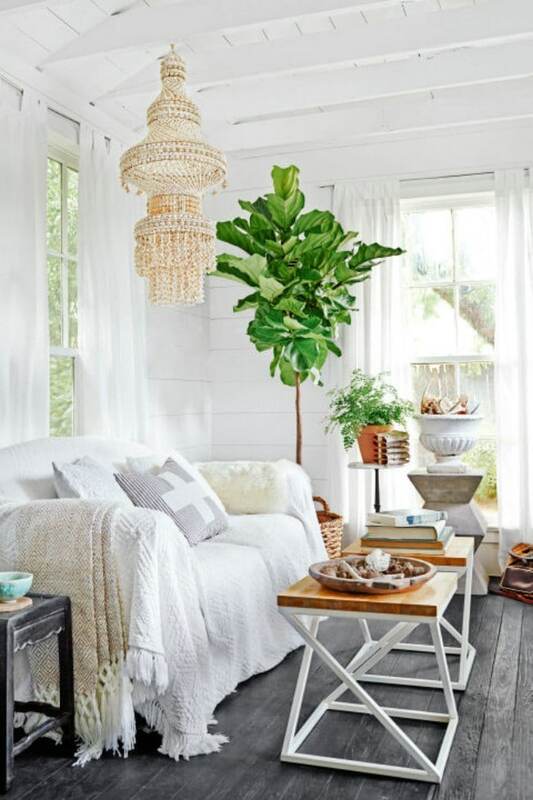 One of the most striking examples out of these is that of a white living room shown above where the decorator has used DIY to pack a stylish punch to the decor of this room housed in a North Carolina home. Here, the owners have created a warm ambiance by installing rustic wooden benches that are used as coffee tables. These tables look striking against the white sofa, chair and the homemade couch. The ladder, wooden crate and the map hung on the wall also integrate nicely with the white decor. The coastal living room seen in the image above looks quite dressy with blue and white color scheme working beautifully in the decor. 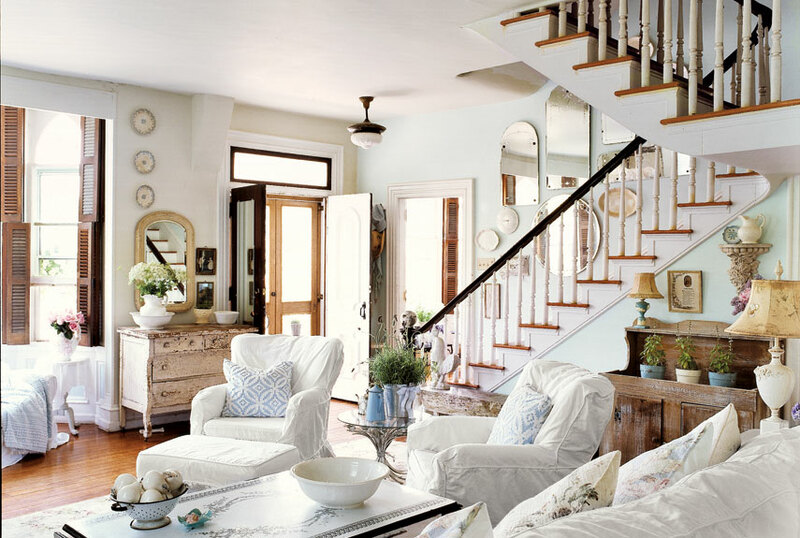 The white sofas, and the chairs are layered with charming blue and white pillows thrown casually. These pillows help in breaking up the coldness of this room, and spread a feel of cheerfulness across. The curtains with blue stripes also help in creating a cozy feel. One cannot help but notice the lovely wicker stools with blue upholstery that are placed next to the sofas. These help in sealing the coastal theme used in the decor. Wow…what a living space it is! The living room looks as if the outdoors are let inside. The big window faces the seating area, and is draped with white curtains. The white couch looks comfy and is layered up with fluffy pillows in blue and white patterns. 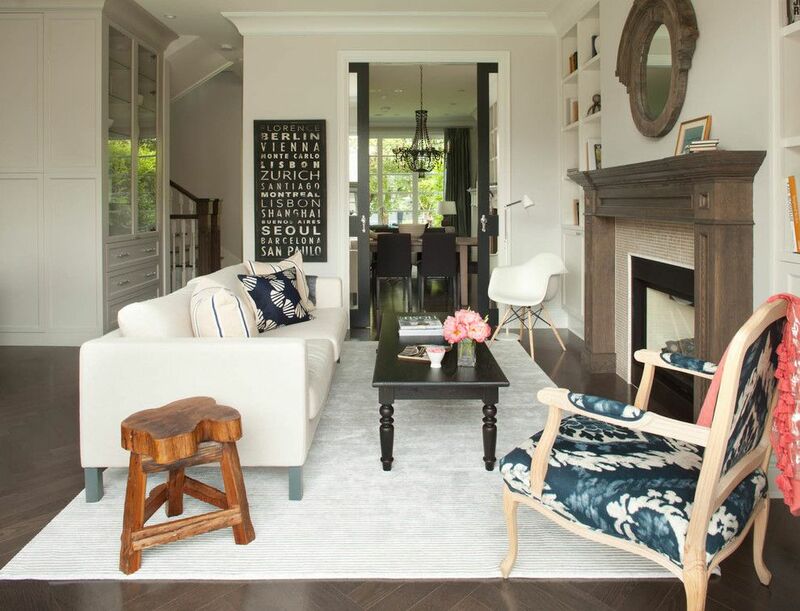 In addition, the decorator has also placed wicker chairs with blue and white color patterns that match nicely with the rest of the palette dominated by white. 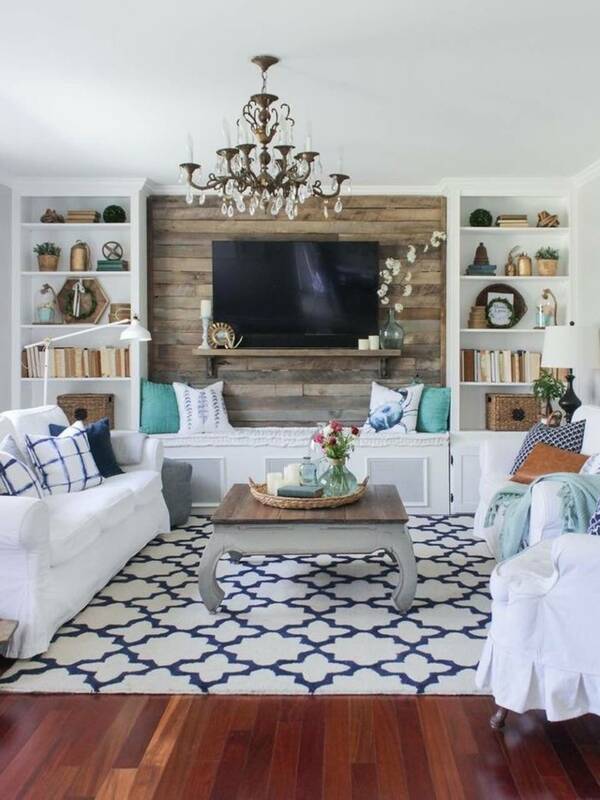 The look of this room gets a boost from the big white lamp and the blue pot placed on either sides of the white couch. 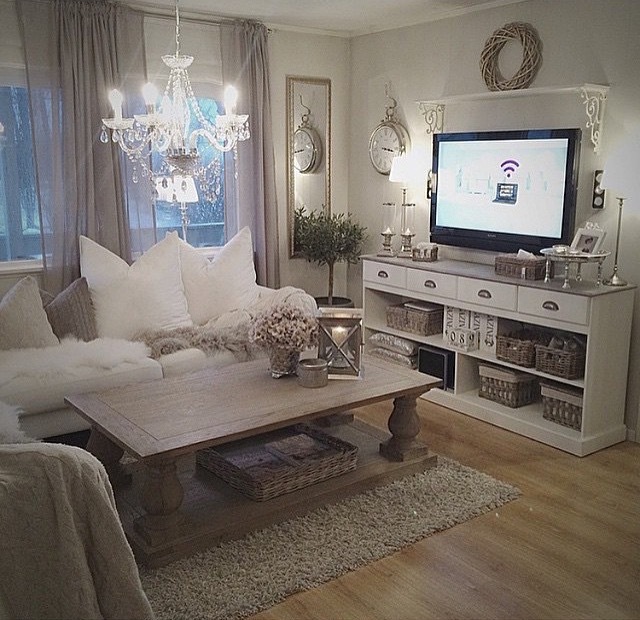 Who would say that a white living room always looks icy and cold after looking at this stunning image? The picture perfect room here features bold textures that match well with one another. Apart from bold white, the decorator has used other textures of wood that lend a vintage feel to the decor. For example, the paint used on the fireplace mantel has been retained in its original texture and looks vintage. The cupboard with linen and towels dates back to 18th century America and offers a striking contrast against the white sofa and chairs. The white living space above looks every bit modern and dreamy. It has walls that are painted in pure white. Apart from the walls, the two sectional sofas and the tufted coffee table too are white. All this white gets a boost from the sudden burst of yellow splashed on the cushion as well on the pottery arrangement placed on the coffee table. The yellow integrates nicely with white and adds up to the vibrancy of the decor. In all, the decor looks anything but boring. White couches living room ideas offer you a chance to use myriad textures and bold patterns. The Danish living room shown above makes use of one such idea that celebrates the colors of grey and white. The walls are painted in white with a matching couch layered up with fluffy white pillows. This white palette gets a boost from the grey tones used on the textured screen wall, the fluffy rug and the throw placed on the sofa. The rug in black and white enhances the style and integrates well into the decor. This living space has been designed by Anne Hepfer who wanted to bring in a surreal feel to the interiors. The white chunky sofa and the custom chairs are enhancements to the sophisticated decor. The designer has used golden tones to break away the coldness of the white palette. She has also used greens and flowers to bring in color and brightness. The painting hung above the fireplace mantel has been designed by Erin Rothstein and looks engaging. The white sofa living room in the image above appears to have a powerful effect on everyone. It looks contemporary with white chunky sofas with Kravet fabric upholstery. On the sofas, the decorator has placed layers of fluffy yellow and green pillows that add up to the brightness of the room. The space seems to appear bigger and more colorful with the two artworks hung on the walls. Can an Asian themed room project a white decor as beautifully as other modern styled living spaces? Well, looking at the picture above, we would have to admit that it surely can! The room above has used a color scheme of brown, black and white. The only piece of furniture in white is the chunky couch and the two ornamental stools with carvings. The rest of the furniture has a brown dark color palate. The white couch is decorated with black and golden toned pillows. The horse painting behind the couch is in tones of white and black, and amalgamates well into the decor. White goes well with any other color and can also break the saturation in an instant. For example, in the room above, the white colored sofas break the monotonous tone set in by the yellow, orange and wooden accents used all over. These accents are used on the reading chair, the ottoman and the throw pillows. These white sofa living room ideas shown above are different in style and patterns. All of them are elegant and will suit you. Go through them carefully and do ping back if you loved reading about them!